The La Grange Fire Department provides comprehensive advanced life support services to residents and visitors of the Village of La Grange. Along with responses within La Grange, the Department also provides and receives mutual aid from neighboring towns when necessary. This service is provided with a combination of a paramedic ambulance and a paramedic-equipped fire engine. 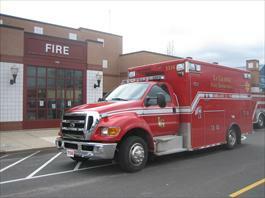 The La Grange Fire Department utilizes cross-trained firefighter / paramedics. The department currently has 17 Illinois-licensed paramedics and two emergency medical technicians under the direction of Dr. Mark Cichon, Project Medical Director for the Loyola University Medical Center Emergency Medical Services System. The department provides 24-hour coverage with one mobile intensive care ambulance. When the ambulance is being utilized on a call and additional calls for service are received, the La Grange Fire Department paramedic-equipped fire engine is dispatched, along with a mutual-aid paramedic ambulance from a neighboring community. The Village of La Grange charges a user fee for ambulance service and utilizes a private billing company to process the ambulance fees. If you are eligible for Medicare / Medicaid benefits, the Village is required to accept assignment; in other words, we accept whatever the insurance covers. For all billing inquires, please call between the hours of 09:00-12:00, Monday - Friday. If you have any questions or require additional information, please contact the Fire Department at (708) 579-2338 during normal business hours.